When asked how things are going, mild-mannered Scandinavians in Minnesota often answer "Can't complain" --unless of course the question concerns the weather. A weather discussion offers far more opinions than does any other topic. Of course, weather occurs everywhere, but in Minnesota weather talk takes on a religious nature. Just like religion, weather is life, not just a detail regarding convenience or inconvenience. Life on our farm was defined by the weather. Summer weather determined directly the success of the farm. Summer ended with the first hard freeze in the fall. Then it was crucial that winter be delayed until the crops were harvested. Winters were 'mild' or 'hard' and the amount of snow days, the number of times pipes froze, and the number of snowmobiling and ice-skating opportunities depended on that winter's weather. When weather is discussed, there is always an appropriate answer. Examples are: "I hear they had two inches in Sunburg Sunday morning, but hardly had a drop here." Or "Yah, had an inch the other night but we needed at least three." I can truthfully say that I never heard anyone say, "You know, this year we got just the right amount of rain just when we needed it." This shows that 'weather talk' for farmers is more than just talk. For farmers weather can mean whether a loan can be paid off or a new implement can be purchased. Of course, it is winter weather that provides the stories to discuss and re-discuss through the years. Just as hurricanes are named, so are historic winter storms--with each family having their own embellishments. For the Mankell family, Doug was born in the Armistice Day storm of 1942, for example. 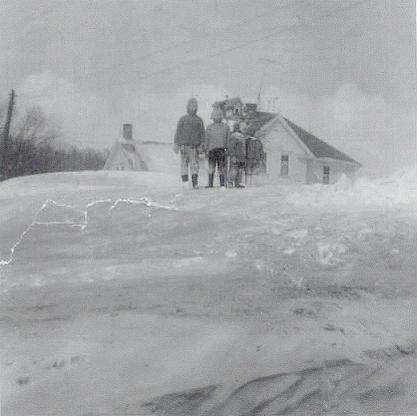 My first memorable huge storm was the St. Patrick's Day storm of 1965. The drifts were so high that I saw for the first time the inside of a birdhouse. In this case the birdhouse by the chicken coop was about 10 feet off the ground and the drift under it was about 8 feet high. Dad dug paths and tunnels between the buildings and for a kid age 9 with no responsibilities, this blizzard was pure fun and excitement. Added fun was that our 3 year old cousin Grady, (then from Wahpeton SD) was staying with us. He had come a few days earlier to stay with us while his brother was born. So now I never have trouble remembering how old his brother Kayne is, as I know he was born in March 1965. 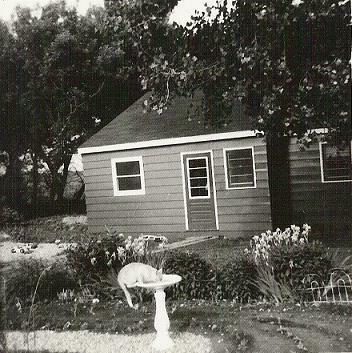 The birdhouse is visible between Carolyn and Kurt. The homestead farmhouse is in the background. Another memorable storm occurred in 1963. My brother Kurt was very little and was sick--probably with tonsillitis, as was the usual trend with us three kids. Mom and Dad hurried to New London, nine miles away, to see the doctor and get medicine, knowing the storm was coming. They didn't quite make it home and were stopped by a drift west of Haglund's farm, which was 3/4 of a mile from home. Leaving Mom and Kurt in the car, Dad walked home to get the tractor and manure spreader which he drove back to get Mom and Kurt. We were waiting in the yard as we saw Dad drive back on the tractor with Mom and Kurt, covered with blankets, sitting on bales in the manure spreader. This story has been told and retold many times. Mom always looked back on this, so fearful of what could have happened if they were not able to get medicine for Kurt. A very exciting storm occurred in 1971. The morning was beautiful. Having waged the usual fight against boots with Mom, I left for school all dressed up--in a dress and shoes with heels. The storm struck in the late morning. It arose so quickly that the buses could not be sent out soon enough to get us "country kids" home. Therefore we had to stay in town. Remarkably, this had never happened before. Mom was also stranded in town because she was working. I stayed with the Meder family; Carolyn and Kurt stayed with the Rupp family. Mom stayed with her Aunt Hannah Rose, no doubt using her emergency suitcase (complete with curlers) that she always kept in the car in the winter. Of course, this was great fun for us kids but certainly was a major headache for grownups. After this, the school system assigned each "country kid" to a "town family" for just such emergencies. Remarkably, we did not lose electricity during most of these storms. Except for the storm in 1975. I called home from college to find that Dad, Carolyn and Kurt were getting heat only from the wood stove in the basement. Mom was stranded in New London. I was at St. Olaf, huddled in blankets due to greatly reduced heat, listening on the radio to the Vikings in the Super Bowl. (from Carolyn: On the farm the electricity returned just in time for us to watch the Super Bowl, though the Vikings lost. Dad, Kurt and I hunkered down for several days during this storm, with Dad teaching us some basic skills for staying warm. The three of us slept in one bedroom--the smaller room with only one exterior wall. The other bedrooms each had 2 exterior walls and were colder. Our body heat helped warm the room. We hung blankets in hallways to minimize the space in the house we had to keep warm. We primarily stayed in the kitchen and one bedroom. We used a Coleman camp stove to warm our hands and cook meals, primarily soup and eggs. I have determined over the years that I do not have a realistic view of Minnesota weather. Having left the state after college I have not lived in Minnesota with adult responsibilities. Dad "blew out" the driveway with the tractor and snowblower did other outside chores after heavy snowfalls. If driving was necessary, that fell to Mom and Dad. I never had to worry about getting to work in bad weather. I listened to WCCO-am, hoping to hear "Schools are closed at New London-Spicer." Then Carolyn and I could play Yahtzee all day! I remember once that on our first trip to town after a storm, our emergency purchase was more Yahtzee scorepads at Ben Franklin. After winter, a sure sign of spring was mud! But it also meant flowers were on the way. Tulips sometimes peaked through even if there was scattered snow on the ground. We knew it was soon Grandpa Herman's birthday (May 14) when the lilac and snowball bushes bloomed. Left: Vivian's pink and white peony plants. Right: Vivian's irises and poppies. Barigold taking a drink next to the irises. 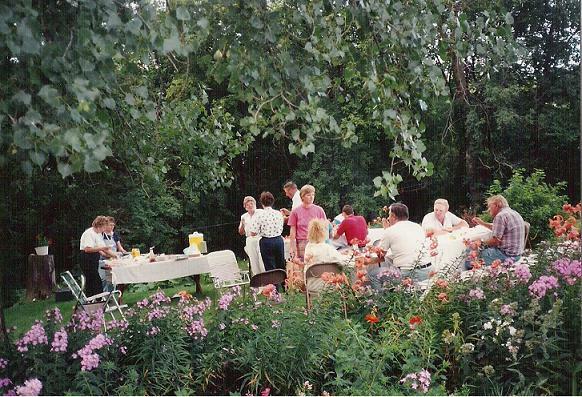 A family picnic in 1991 with phlox and tiger lilies blooming in the flower bed. The cottonwood tree was planted at the time the homestead was founded by HW and Elizabeth Mankell. Left to Right: Bette Mankell, Vivian Mankell, Marge Larimer, Diane Christopherson, Sherman Mankell, Marlys Schilz, Judy Mankell, Scott Muellner, Jerry Schilz, Alloys Christopherson, and Orlynn Mankell. Summers meant industrial strength mosquitoes and a few days each year were in the 'sticky' category. There are also summer weather stories in family history. At Marge and Bill Larimer's wedding it was so hot that the candles melted. And of course, Doug and DeAnn Mankell's wedding, even though in Kansas, has provided tales of torrential rains and seeing Millie Bergan driving through the floods. The fall was glorious, with the hunt for bittersweet in the trees, the scent of burning leaves, just the right chill in the air, and the disappearance of mosquitoes. I never realized how beautiful the leaves really were, until I had been gone many years. I had not been in Minnesota in the fall for 20 years, until Sept 1999 when Dad died. The leaves and the combines in the fields brought back vivid fall memories. So, winters came and went--sometimes without even one snowday off from school. They were followed by spring for planting, summer for growing and fall for harvesting. Then it was winter again. And so goes life and weather for a farming family in Minnesota.